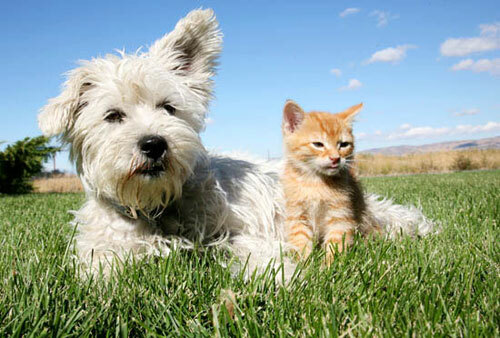 There are two broad categories of worms that may affect our pet dogs and cats, intestinal worms and heartworms. Please see our heartworm page for more information. If you’re pet has a large number of worms it may find it difficult to maintain body condition and it can lose weight and/or have a pot belly appearance. In some cases it can cause vomiting, diarrhoea and even anaemia (a low red blood cell level). Occasionally, heavy intestinal worm burdens can cause death. It is important to maintain a routine worming treatment for your pets, to reduce the incidence of infection and to reduce environmental contamination. There are many worming treatments available for the various worm infections that occur in our pets. These are available as tablets, spot-on, or pastes. Re-infection is a common problem, particularly in pets that are in contact with a heavily contaminated environment. Another very important reason to worm your pets is to protect your family; as children in particular can become infected with certain dog and cat worms. De-worm your puppies & kittens every 2 weeks until they are 12 weeks of age, then every month until they are 6 months of age and then every 3 months for the rest of their life. A great way to remember – is every change of season – de-worm your pet. Wormers all go by pets weight, so if unsure of the weight of your pet, bring them in and have them weighed to make sure de-worming is accurate. There are many different worming treatments & preventions available, please call the hospital to find out which suits best.